Initially, I was absolutely terrified by the idea of moving into the same apartment complex as sous chef's parents. However, it turned out to be the best thing ever! - As they're so near, we could drop by for dinners whenever we want, they never had to force us! 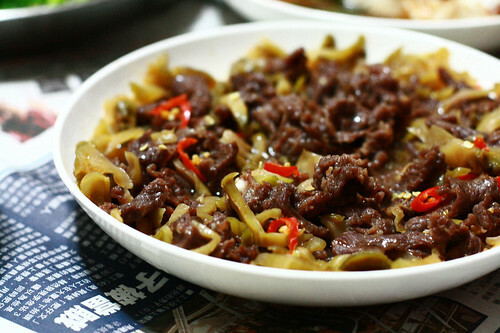 This easy stir fried beef with chinese preserved veggie dish is one of my favorite dishes from sc's parents. Marinate beef with a bit of dark soy, sugar, white pepper and 1 tsp corn starch for at least 15 minutes. In a hot frying pan, saute garlic and chilli with a bit of olive oil, add marinated beef, add preserved vegetables, adjust seasoning if necessary, serve with steamed rice. Spicy, sweet, sour, savoury, smoky...all in one dish! It's quick, easy, homey, Chinese comfort food at its best. Oh yeah I like this too, my mum makes this all the time, I love preserved veges! Haha, so they really lined the table or the floor with newspaper when eating yeah? I saw that on drama. :P This dish looks delicious! This is like comfort food!! I line my dining table with newspapers too...hahahha! It is the only time I take a good look at advertisements page. This is so simple and so tasty! Great with rice!